Today, unbeknownst to many of us in the USA, Indo-Caribbeans form a majority or near majority of the population in the countries of Guyana,Trinidad, and Suriname and important if small minority populations in Belize, Jamaica, Grenada, and other islands of the Caribbean. They hold important places in all levels of these societies and continue to create and recreate a unique Indo-Caribbean culture that strives to exist alongside the cultures of fellow Caribbean communities. With the advent of colonialism, Indians found themselves increasingly bound for new and far away places, often as indentured laborers. Many landed in parts of Africa, many found their way to the Mascarene Islands, Fiji, Canada, California, and of course to England, the home of their colonial masters. Between 1838 and 1917 about half a million Indians came to the Caribbean and South America. They majority came as replacement workers for newly freed African slave labor. They took up residence in the old slave quarters and worked on plantations, often isolated from other Caribbean communities. The immigrants came from diverse regions within India, but the majority came from North India's Bhojpuri region and their language, Bhojpuri, along with English, became the language of communication amongst the Indo-Caribbeans. Within India, the Bhojpuri language, often referred to as Bihari because the majority of its speakers reside in the state of Bihar, can also be found in eastern Uttar Pradesh, southern Assam and western Bengal. A sizeable minority of Indian laborers came from the Tamil and Telugu speaking regions of South India and preserved a form of Caribbean Tamil, which has, along with the Bhojpuri mentioned above, faded from use over the years. Along with language and social customs, these Indian immigrants brought with them their music, recorded and preserved on this CD by Alan Lomax. In India there exist rich and diverse folk and neo-classical traditions, which for the most part are seldom recorded. Folk music takes a backseat to the music of the burgeoning Hindi film industry of Bombay and the recordings of professional classical musicians for both local and foreign consumption. The few folk recordings that are made usually center on certain communities in North India, the desert nomads of Rajasthan and Gujarat for instance, or the Baul tradition of Bengal. But when one considers that India is a country with 25 states, each containing numerous tribes, castes, languages (there are 325 recognized Indian languages) and folk music styles, it is readily obvious that, as a nation, India's folk traditions are grossly under-recorded. Many of these continue to thrive in rural areas, though with advances in satellite technology and a greater distribution of Hindi films, it's hard to say how long it will be before local folk entertainers are pushed out or forced to play the latest 'filmi' hit. While it is difficult to find recordings of folk musicians in the various regions of India, it is doubly difficult to find recordings of folk musicians in the Indian diaspora. Two types of Indian music roughly based on folk traditions have in recent years found popularity in the Indian diaspora, those being bhangra, a folk dance style originally from the state of Punjab that has been modernized to include keyboards and drum machines, and chutney, a Caribbean dancehall music popular amongst the Indo-Caribbean community. While these two dance styles have done a lot to maintain or revive interest in Indian-based music amongst the youth of the Indian diaspora, they have not really led to an increased interest in the traditional music their immigrant forefathers developed so many year before. 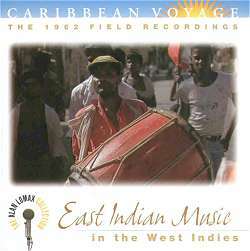 All of which leads me to this CD, East Indian Music in the West Indies, part of the Alan Lomax Caribbean Voyage collection. I don't like to think of CDs as artifacts, or as having strictly historical value, but with the continuing disappearance of unrecorded traditional music forms in India and particularly in the Indian diaspora, the historical aspect may end up being the primary value of records like this one. Still, Lomax was not the only musicologist to record Indian music in the West Indies. In 1975, Caribbean Voyage series editor Kenneth Bilby produced the album Bongo, Backra and Coolie for Folkways which included four tracks of coolie or Indo-Caribbean music and in 1956 Emory Cook recorded East Indian Drums of Tunapuna, Trinidad. Still, with 13 musical tracks, this CD could be considered the first major international release of East Indian Caribbean music. So what is this East Indian Music in the West Indies? Is it a fusion of Indian and Caribbean musical styles and sensibilities? Well, in part, yes, but this music is much closer to the music of India than it is to many of the African or European inspired musical forms found in the Caribbean. I doubt the differences found between this Indo-Caribbean music and folk and neo-classical music of India could be accurately or confidently attributed to specific African or European influences. Still, there is some creolization at work in much of the music, lending it a unique Indo-Caribbean character, whether it be in the Tassa drumming styles of Trinidad or in the Bhojpuri and Tamil dialects used for singing this traditional music. A small range of folk styles can be found on the CD, from Tassa drumming (a predominantly East Indian Muslim drumming style) to Tan singing (a predominantly East Indian Hindu neo-classical singing style). There are a couple of wonderful examples of Indo-Caribbean women's folk music, including a lullaby, a grinding song, and a wedding song (wedding songs were important sources for modern chutney). The CD liner notes makes the excellent point that ordinary women are often important bearers of folk song traditions. There are two examples of Madrasi or Tamil Indo-Caribbean music, one from a Kali ceremony on the island of Guadeloupe. The Tamil influence in the French-Caribbean seems greater than that of the British-Caribbean, possibly reflecting the French influence in the Madras and Pondicherry regions of South India. The majority of the songs on this CD have some religious connotation in their text. This is not surprising, as the folk stories and music of India are rooted in its religious texts and oral traditions. Krishna and Rama are favorite subjects in both Indian and Indo-Caribbean music. Compared with the other releases in the Caribbean Voyage series, this is a short CD at 53 minutes running time. I don't know whether the editors are saving selections of Indo-Caribbean music for future releases or whether this was all that Lomax recorded. I hope the former is true, but I guess we'll have to wait and see. Also, the booklet that accompanies the CD seems a bit sparser than previous ones and there is little information on the musicians who were recorded. I should note that on my copy of East Indian Music in the West Indies three tracks are mislabeled. Women's Lullaby, labeled track 5, is actually track 6, while track 6, labeled Sohar, is actually track 7. Track 7, Grinding Song, is actually track 5. While I can't say that people with a wide-ranging interest in Caribbean music won't enjoy this CD, I imagine the collection will sound foreign and thoroughly un-Caribbean to the cursory Caribbean music lover. Rather, this music seems more suited, and will undoubtedly be more recognizable, to listeners of Indian folk music (I emphasize 'folk' as opposed to classical). I just happen to be lucky, being a lover of both. One important question is whether this CD will spark an interest in the folk music of the Indian diaspora, or even in the folk music of India itself. While I am not overly optimistic, I sincerely hope it does.